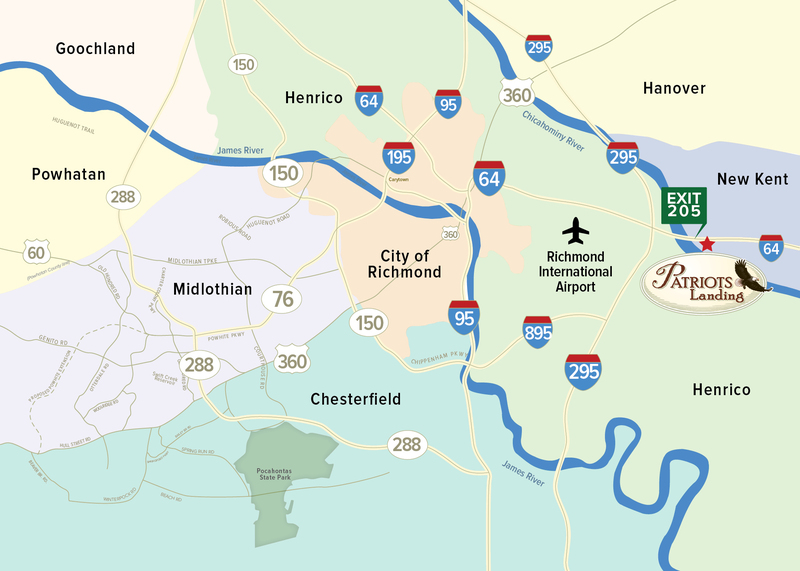 Patriots Landing is conveniently located near Interstates 64 and 295 in New Kent County near Quinton and Bottoms Bridge – putting you close to work and shopping, but miles away from the congestion and sprawl of suburbs. It is just 30 minutes from Williamsburg. New Kent’s commitment to managed growth surrounding – and including – this community, means it will always maintain its pastoral charm. Our quiet, bucolic community is just minutes away from work and shopping. Many stores are nearby, and more are coming soon. 12 minutes from The Shops At White Oak Village. Stores include Lowe’s, Target, PetSmart, JCPenney, Sam’s Club, Best Buy, and 45 more including banks, restaurants, and hotels. Within 5 minutes of 2 grocery stores, 2 drug stores, post office, bank, New Kent Medical Center, gas stations, dry cleaners, 3 childcare centers, veterinarian, hardware store, churches, haircare, McDonalds, Bojangles, Taco Bell, and more to come (Dunkin Donuts under construction). New Kent is one of the oldest counties in Virginia, dating to 1654, when English colonists built palatial homes along the Pamunkey River. They named it after their native Kent, England. British, Continental, French, Union and Confederate troops – as well as Powhatan Indian tribes – have all walked through these forests, adding to the sense of history that surrounds our community. The area around Patriots Landing has played host to many well-known figures. George and Martha Washington were married in nearby St. Peter’s Parish. President John Tyler’s wife, Letitia Christian, was baptized at the same church.